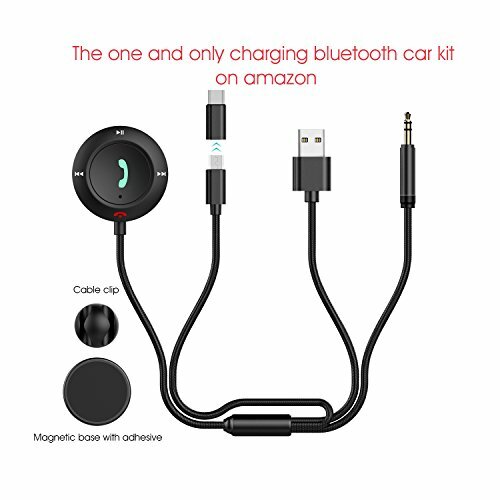 Making hands-free wireless phone calls, charging and music streaming together, MiCar L8 multi-function Bluetooth car kit is perfect for home and car audio stereo system. This Bluetooth receiver with noise reduction technology reduces signal loss and noise, and makes sure the premium sound quality is possible. NO MORE BACKGROUND NOISES AND ECHOES! Micar hands-free audio adapter plays your music list from any Bluetooth enabled devices, enjoy music via driving or at home easily. - Do not support date transfer. - Some power bank does not meet the demand of required power for normal operations. - Please long press the hang up key to turn off the Bluetooth car kit if you do not use it for a long time. - Please do not use or store it in the damp condition. - Please keep it away from children. - Recommend to use it with MiCar car charger or quality brand car charger. - Disassembly only by the professionals. - Be careful to prevent dropping off. - The working temperature is -10℃~ 60℃ (14 ~ 140℉). Convenient to Mount: peel the film of the 3M adhesive off, and adheres the disk to any part near the centre panel, and then magnetically attach the controller to the disk; 18-month warranty and friendly customer service & life-time technique support. If you have any questions about this product by MiCar, contact us by completing and submitting the form below. If you are looking for a specif part number, please include it with your message.